The NMBA has become aware that there are a small number of registered nurses, enrolled nurses and midwives who are promoting anti-vaccination statements to patients and the public via social media which contradict the best available scientific evidence. The NMBA is taking this opportunity to make its expectations about providing advice on vaccinations clear to registered nurses, enrolled nurses and midwives. The NMBA recognises the Australian National Immunisation Handbook 10th edition as providing evidence-based advice to health professionals about the safe and effective use of vaccines and the public health benefits associated with vaccination. The NMBA supports the use of the handbook by registered nurses, enrolled nurses and midwives who are giving vaccines. The handbook is available from the Immunise Australia Program website. The NMBA expects all registered nurses, enrolled nurses and midwives to use the best available evidence in making practice decisions. This includes providing information to the public about public health issues. All registered nurses, enrolled nurses and midwives are required to practise in accordance with professional standards set by the NMBA, including the codes of conduct, codes of ethics and the standards for practice, in particular the social media policy and the guidelines for advertising regulated health services. What should I do if I notice a nurse or midwife is promoting anti-vaccination material? If you have concerns about a nurse or midwife you can make a complaint to AHPRA. The NMBA will consider whether the nurse or midwife has breached their professional obligations and will treat these matters seriously. Any published anti-vaccination material and/or advice which is false, misleading or deceptive which is being distributed by a registered nurse, enrolled nurse or midwife (including via social media) may also constitute a summary offence under the National Law and could result in prosecution by AHPRA. 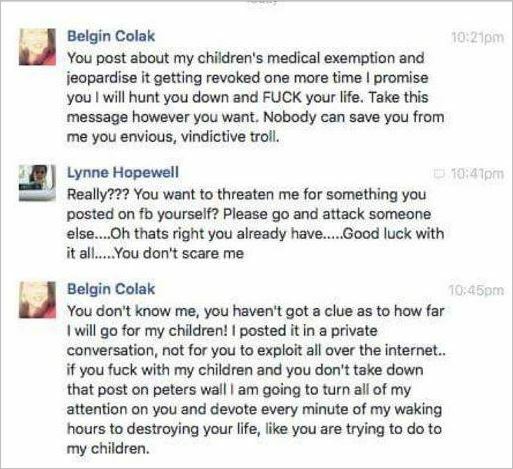 The following addenda contain excerpts from the Nursing and Midwifery Board of Australia’s competency standards, codes, guidelines, and social media policy from which readers may wish to choose when lodging any complaint regarding the anti-vaccination activism of Matty Wightman. Relates to the professional, legal and ethical responsibilities which require demonstration of a satisfactory knowledge base, accountability for practice, functioning in accordance with legislation affecting nursing and health care, and the protection of individual and group rights. Relates to self-appraisal, professional development and the value of evidence and research for practice. Reflecting on practice, feelings and beliefs and the consequences of these for individuals/ groups is an important professional bench- mark. Relates to the coordination, organisation and provision of nursing care that includes the assessment of individuals/ groups, planning, implementation and evaluation of care. Relates to establishing, sustaining and concluding professional relationships with individuals/groups. This also contains those competencies that relate to nurses understanding their contribution to the interdisciplinary health care team. Nursing and Midwifery Board of Australia Codes and Guidelines. 1 Nurses practise in a safe and competent manner. 2 Nurses practise in accordance with the standards of the profession and broader health system. 1 Nurses are responsible for ensuring the standard of their practice conforms to professional standards developed and agreed by the profession, with the object of enhancing the safety of people in their care as well as their partners, family members and other members of the person’s nominated network. This responsibility also applies to the nurses’ colleagues. 2 Nurses practise in accordance with wider standards relating to safety and quality in health care and accountability for a safe health system, such as those relating to health documentation and information management, incident reporting and participation in adverse event analysis and formal open disclosure procedures. 3 Nurses practise and conduct themselves in accordance with laws relevant to the profession and practice of nursing. 1 Nurses are familiar with relevant laws and ensure they do not engage in clinical or other practices prohibited by such laws or delegate to others activities prohibited by those laws. 2 Nurses witnessing the unlawful conduct of colleagues and other co-workers, whether in clinical, management, education or research areas of practice, have both a responsibility and an obligation to report such conduct to an appropriate authority and take other appropriate action as necessary to safeguard people and the public interest. 4 Nurses respect the dignity, culture, ethnicity, values and beliefs of people receiving care and treatment, and of their colleagues. 5 Nurses treat personal information obtained in a professional capacity as private and confidential. 6 Nurses provide impartial, honest and accurate information in relation to nursing care and health care products. 1 When nurses provide advice about any care or product, they fully explain the advantages and disadvantages of alternative care or products so individuals can make informed choices. Nurses refrain from engaging in exploitation, misinformation or misrepresentation with regard to health care products and nursing care. 2 Nurses accurately represent the nature of their services or the care they intend to provide. 3 Where a specific care or a specific product is advised, nurses ensure their advice is based on adequate knowledge and not on commercial or other forms of gain. Deceptive endorsement of products or services or receipt of remuneration for products or services primarily for personal gain, other than remuneration in the course of a proper commercial relationship, is improper. 7 Nurses support the health, wellbeing and informed decision-making of people requiring or receiving care. 8 Nurses promote and preserve the trust and privilege inherent in the relationship between nurses and people receiving care. 1 An inherent power imbalance exists within the relationship between people receiving care and nurses that may make the persons in their care vulnerable and open to exploitation. Nurses actively preserve the dignity of people through practised kindness and respect for the vulnerability and powerlessness of people in their care. Significant vulnerability and powerlessness can arise from the experience of illness and the need to engage with the health care system. The power relativities between a person and a nurse can be significant, particularly where the person has limited knowledge; experiences pain and illness; needs assistance with personal care; belongs to a marginalised group; or experiences an unfamiliar loss of self-determination. This vulnerability creates a power differential in the relationship between nurses and persons in their care that must be recognised and managed. 4 Nurses fulfil roles outside the professional role, including those as family members, friends and community members. Nurses are aware that dual relationships may compromise care outcomes and always conduct professional relationships with the primary intent of benefit for the person receiving care. Nurses take care when giving professional advice to people with whom they have a dual relationship (e.g. a family member or friend) and advise them to seek independent advice due to the existence of actual or potential conflicts of interest. 9 Nurses maintain and build on the community’s trust and confidence in the nursing profession. 1 The conduct of nurses maintains and builds public trust and confidence in the profession at all times. 2 The unlawful and unethical actions of nurses in their personal lives risk adversely affecting both their own and the profession’s good reputation and standing in the eyes of the public. If the good standing of either individual nurses or the profession were to diminish, this might jeopardise the inherent trust between the nursing profession and the public necessary for effective therapeutic relationships and the effective delivery of nursing care. 3 Nurses consider the ethical interests of the nursing profession and the community when exercising their right to freedom of speech and participating in public, political and academic debate, including publication. 10 Nurses practise nursing reflectively and ethically. 1 Nurses practise nursing reflectively and ethically, in accordance with the Code of Ethics for Nurses in Australia, in order to learn from experience and contribute to personal and professional practice. 2 Nurses develop and maintain appropriate and current quality nursing advice, support and care for each person requiring and receiving care and their partners, families and other members of their nominated social network. This responsibility also applies to colleagues of nurses. 3 Nurses evaluate their conduct and competency according to the standards of the nursing profession. 4 Nurses contribute to the professional development of students and colleagues. 5 Nurses participating in research do so in accordance with recognised research guidelines and do not violate their duty of care to persons receiving nursing care. 6 Nurses advise employers and any persons in their care of any reduction in their capacity to practise due to health, social or other factors, while they seek ways of redressing the problem. 1 Nurses value quality nursing care for all people. 2 Nurses value respect and kindness for self and others. 3 Nurses value the diversity of people. 4 Nurses value access to quality nursing and health care for all people. 5 Nurses value informed decision-making. Nurses value people’s interests in making free and informed decisions. This includes people having the opportunity to verify the meaning and implication of information being given to them when making decisions about their nursing and health care. Nurses also recognise that making decisions is sometimes constrained by circumstances beyond individual control and that there may be circumstances where informed decision making cannot always be fully realised. 1 Self: Nurses make informed decisions in relation to their practice within the constraints of their professional role and in accordance with ethical and legal requirements. Nurses are entitled to do this without undue pressure or coercion of any kind. Nurses are responsible for ensuring their decision-making is based on contemporary, relevant and well-founded knowledge and information. 2 Person (health consumer): Nurses value the legal and moral right of people, including children, to participate whenever possible in decision-making concerning their nursing and health care and treatment, and assist them to determine their care on the basis of informed decision making. This may involve ensuring people who do not speak English have access to a qualified health interpreter. Nurses recognise and respect the rights of people to engage in shared decision-making when consenting to care and treatment. Nurses also value the contribution made by persons whose decision-making may be restricted because of incapacity, disability or other factors, including legal constraints. Nurses are knowledgeable about such circumstances and in facilitating the role of family members, partners, friends and others in contributing to decision-making processes. 3 Colleagues: Nurses respect the rights of colleagues and members of other disciplines to participate in informed decision-making. Making these collaborative and informed decisions includes involving the person requiring or receiving nursing care (or their representative) in decisions relating to their nursing or health care, without being subject to coercion of any kind. 4 Community: Nurses value the contribution made by the community to nursing and health care decision-making through a range of activities, including consumer groups, advocacy and membership of health-related committees. Nurses also assist in keeping the community accurately informed on nursing and health-related issues. 6 Nurses value a culture of safety in nursing and health care. Valuing a culture of safety involves nurses actively engaging in the development of shared knowledge and understanding of the crucial importance of safety in contemporary health care. Nurses who value a culture of safety appreciate that safety is everyone’s responsibility. Nurses support the development of risk management processes and a practice environment designed to reduce the incidence and impact of preventable adverse events in health care. Nurses also support the open disclosure of any adverse events to any person affected during the course of their care. 1 Self: Nurses value safe practice and a safe working environment; practise within the limitations of their knowledge and skills; and recognise and avoid situations where their ability to deliver quality care may be impaired. Nurses have a moral and legal right to practise in a safe environment, without fear for their own safety or that of others, and they seek remedies through accepted channels, including legal action, when this is not the case. Nurses value the maintenance of competence in contributing to a safe care and practice environment. 2 Person (health consumer): Nurses recognise that people are vulnerable to injuries and illnesses as a result of preventable human error and adverse events while in health care settings. Nurses play a key role in the detection and prevention of errors and adverse events in health care settings, and support and participate in systems to identify circumstances where people are at risk of harm. Nurses act to prevent or control such risks through prevention, monitoring, early identification and early management of adverse events. Nurses contribute to the confidential reporting of adverse events and errors, and to organisational processes for the open disclosure of these events to persons affected during the course of their care. 3 Colleagues: Nurses work with their colleagues to create a culture of safety. Nurses support the development of safer health care systems through non-punitive human error, adverse event management and related education. Nurses value the critical relationship between consumer safety and interprofessional competencies, including trustful communication, teamwork and situation awareness. Nurses view the detection of their own errors and risks or those of their colleagues as opportunities for achieving a safer health care system. 4 Community: Nurses, acting through their professional and industrial organisations and other appropriate authorities, participate in developing and improving the safety and quality of health care services for all people. This includes actively promoting the provision of equitable, just and culturally and socially responsive health care services for all people living, or seeking residence or asylum, in Australia. It also involves raising public awareness about the nature and importance of consumer safety programs in health care services. 7 Nurses value ethical management of information. 8 Nurses value a socially, economically and ecologically sustainable environment promoting health and wellbeing. When using social media, health practitioners should remember that the National Law, their National Board’s code of ethics and professional conduct (the Code of conduct) and the Guidelines for advertising regulated health services (the Advertising guidelines) apply. Additional information may be available from professional bodies and/or employers, which aims to support health practitioners’ use of social media. However, the legal, ethical, and professional obligations that registered health practitioners must adhere to are set out in the National Boards’ respective Code of conduct and the Advertising guidelines. This entry was posted in anti-vaccination, anti-vaccination dishonesty, Anti-vaccine thugs, hospitals, Immunisation, nurse, public health, skeptic, stop the australian vaccination network, vaccination and tagged AHPRA, anti vaccination, Anti-Vaccination Australia, Australian Health Practitioner Regulation Agency, Belgin Colak, dishonesty, Laura Shakespeare, Life Rebel Chiropractic, Matty Wightman, NMBA, Nursing and Midwifery Board of Australia, registered nurse, Serene Johnson, Tim Shakespeare. Bookmark the permalink. Quite apart from her anti-vax stance, the nurse pontificating above about atrial fibrillation is way off the mark about stroke prevention. The evidence for anti-coagulants like Warfarin in stoke is overwhelming. There is a risk of abnormal bleeding, but it is much smaller than the risk of stroke in atrial fibrillation. (The risk-benefit ratio can change on an individual basis such as the very old with recurrent falls – but the evidence is solid at a population level). Neither Warfarin nor the newer anti-platelet agents damage the stomach lining – this is just misinformation again. Low-dose aspirin is effective in reducing coronary artery occlusion and cerebrovascular stroke – but not effective for stroke prevention in atrial fibrillation. These people should not share their misinformation publicly – it;s potentially dangerous. This is why I love it when people who know what they’re talking about comment on my posts.